Welcome back to Pondering Playtime, my fortnightly series where I share a favourite picture book and a craft or play activity to go with it. 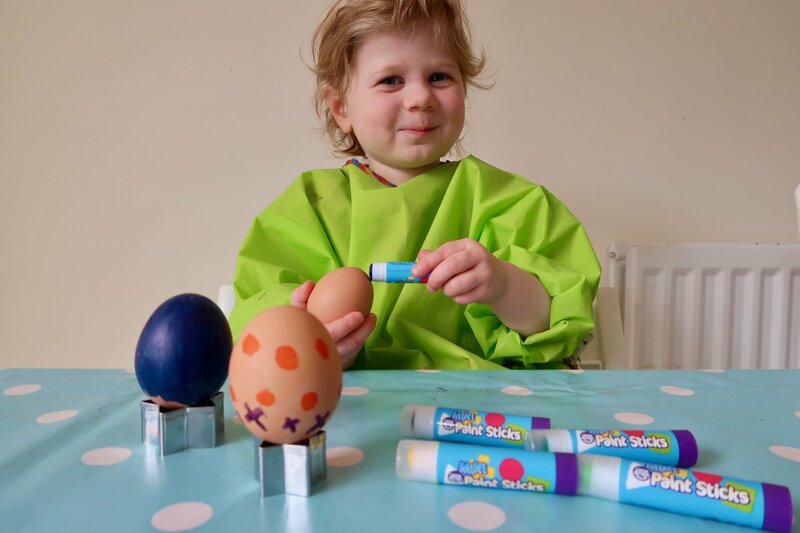 This week, we’ve been gifted some paint sticks by Little Brian, so I’ve chosen Poppy and Sam’s Easter Egg Hunt by Sam Taplin, and we’ve been using the paint sticks to do some Easter egg painting. Poppy and Sam’s Easter Egg Hunt – What’s the Story? 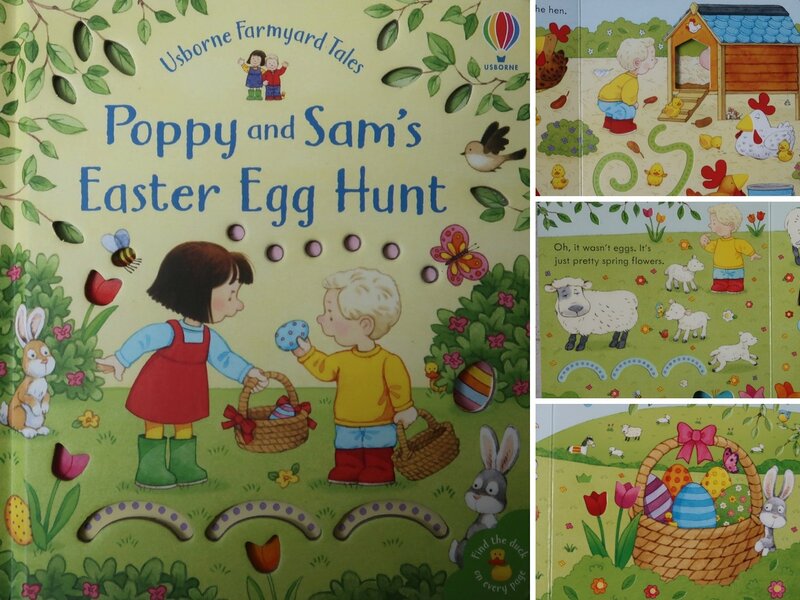 Poppy and Sam’s Easter Egg Hunt is about two friends who search the farmyard for Easter eggs. Have they spotted an egg, or are they mistaken? This is a short, sweet, interactive book with 3D trails to trace with your finger, and little windows which cleverly reveal whether the friends have found an Easter egg or something else. 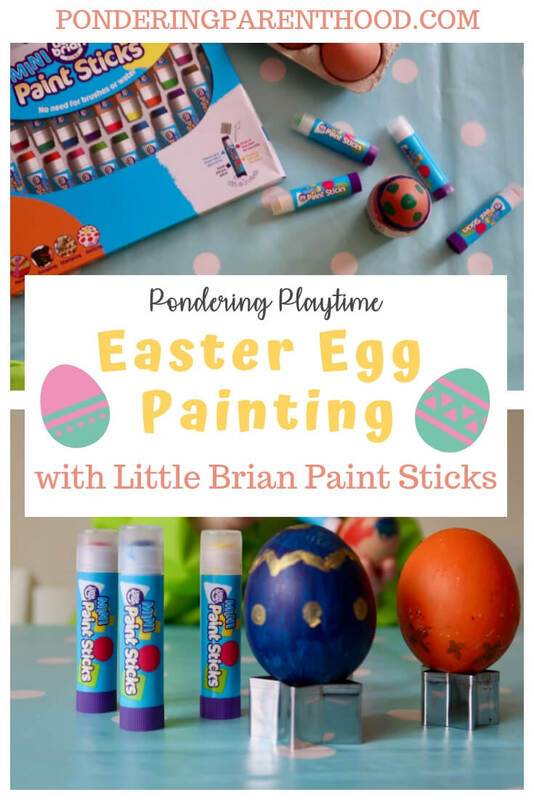 Little Brian kindly sent us a wide selection of products to choose from for this craft activity, but we chose to use the pack of 24 mini paint sticks. I thought the smaller sticks would be easier for the girls’ little hands, especially as I wanted B to have a go, and she’s only just turned one. The only preparation required for this activity was to (very!) 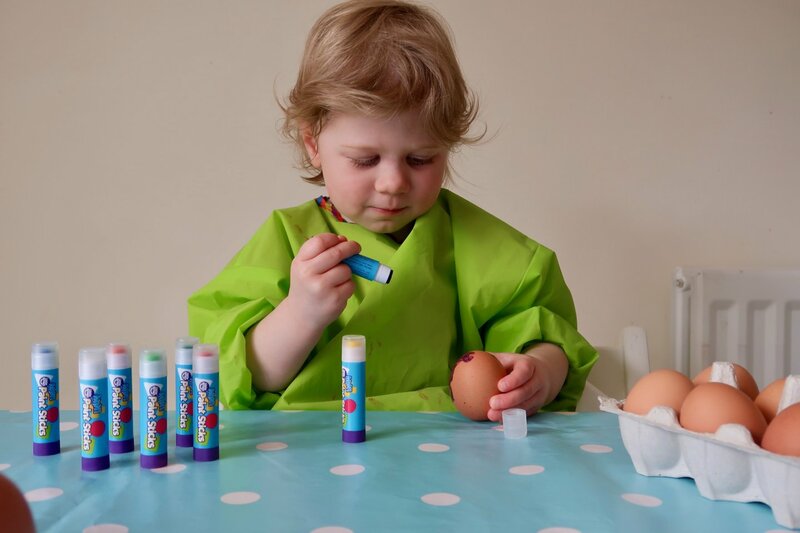 hard boil a pack of ten large eggs, put a cover on the table and get the paint sticks out. The paint sticks don’t require any water; you just remove the lid, twist them up like a pritt stick and paint with them. I’m planning to hide the decorated eggs in the garden on Easter day, for the girls to have their own little Easter egg hunt with! M loves any kind of crafting and was excited as soon as she saw me get our crafting tablecloth out! 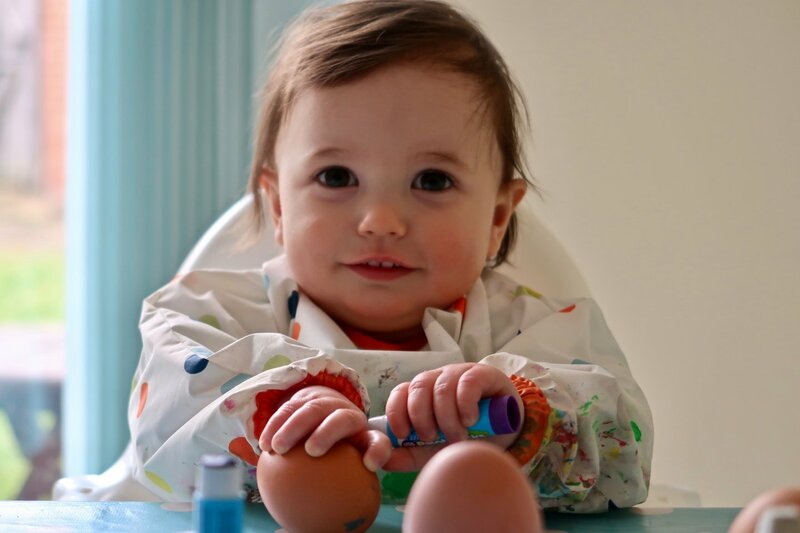 I made sure that both girls were wearing aprons as I thought there was a strong chance that they might use the paint sticks to draw on their clothes, but I needn’t have worried. The only mess was a tiny bit of paint on their fingertips! Amazing! 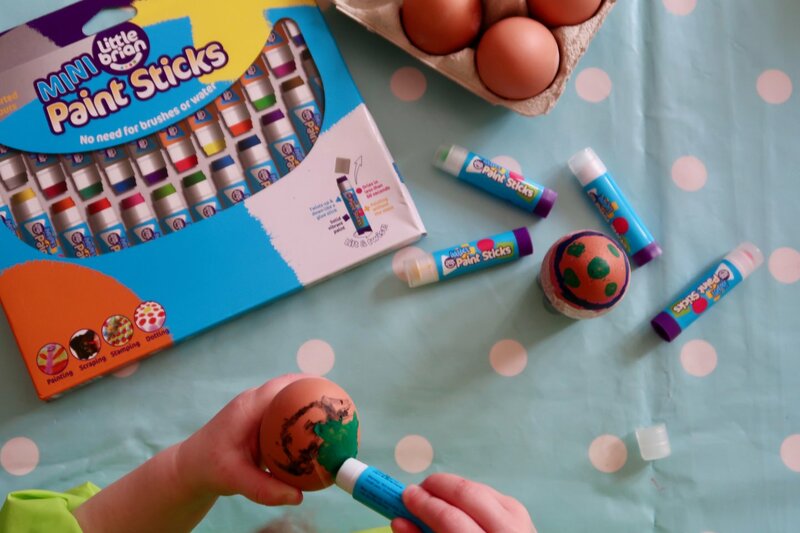 I decorated some eggs too, as I wanted to try the paint sticks out for myself. 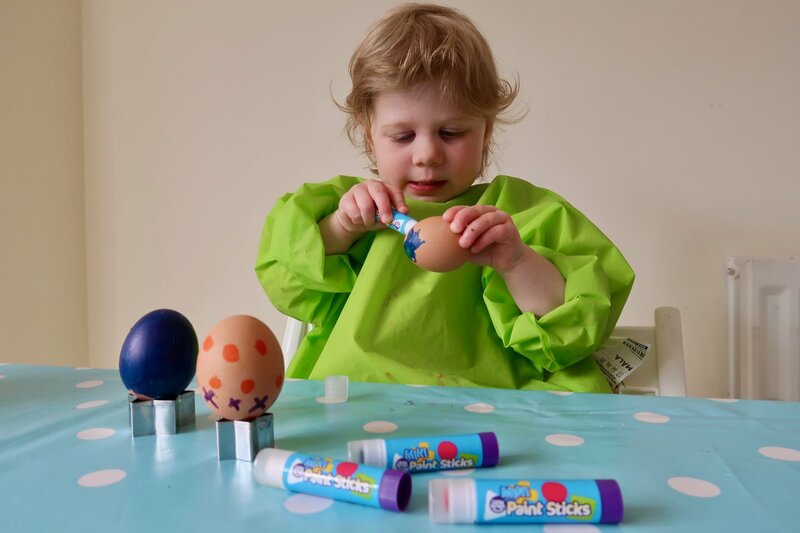 I thought it was quite tricky to be precise with the paint sticks, but I suspect that was because we were painting boiled eggs. I think they’d have been a bit of a dream on paper or card, and I’m looking forward to trying them out. I don’t think we’d have achieved better results with conventional paint, especially as the paint sticks are so quick-drying, so we were able to layer different colours easily. The paint sticks were really easy for the girls to use. M got stuck in straight away, without even needing to be shown how to use them. Even B managed to use them, which is impressive considering that up to now, she’s shown zero interest in doing anything with a pen or pencil other than trying to eat it! Side note: Definitely hard boil your eggs – approximately 50% of our eggs were dropped! As for the book, M made a point of telling me that she enjoyed reading Poppy and Sam’s Easter Egg Hunt, and even thanked me for buying it. What a sweetheart! Matthew read it with her and said he thought it was clever. Definitely something for all ages to enjoy! The only thing I will say is that it was a bit smaller and shorter than I was expecting. It does have lovely illustrations, though, and I like the interactive nature of the book. It makes a change from the usual lift-the-flap books. If you enjoyed this, you can find more Pondering Playtime activities here, and you might like to join my Early Years craft and activity Facebook group; Play Craft, Explore. We’d love to have you! And lastly, don’t forget to Pin it! 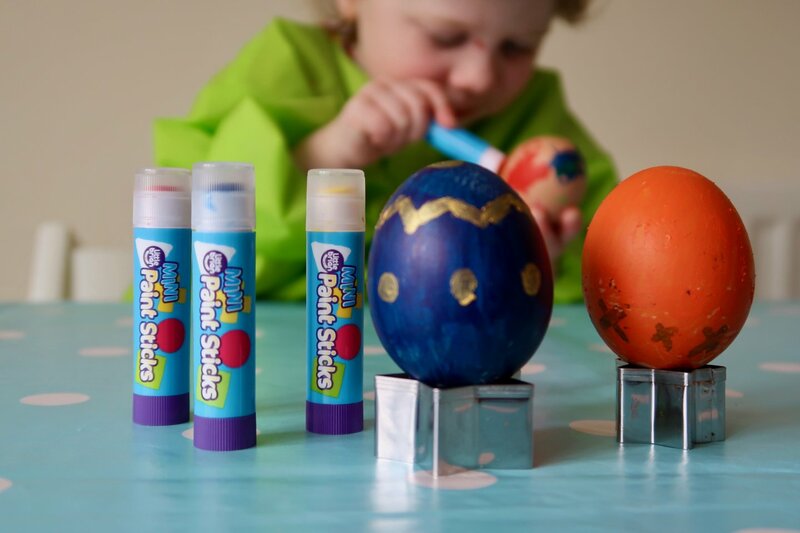 Disclosure: We were sent the Little Brian paint sticks in order to create this activity. However, all opinions are my own. "19 Goals for 2019: First Quarter Progress"
Awh, your little one is so cute! Those sticks look awesome to use. I used to just use paint when I was little but it would quite often slide off which wasn’t easy. Thank you for posting! These are great. They’re really thick, kind of like a lipstick, and stay on well. They dry really quickly, too, so that you can add layers of detail.